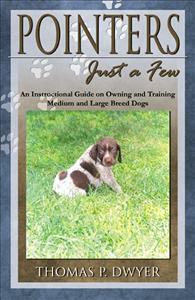 Pointers is an extremely practical guide to choosing, caring for and training your dog. Mr. Dwyer sums it all up at the end when he says, “enjoy your dog.” It is clear that he does. Early on in Tom Dwyer’s book he states “I care who I am selling the dog to and what happens to them.” This is evident from cover to cover as one reads Pointers. It is an extremely practical guide to choosing, caring for and training your dog. Mr. Dwyer sums it all up at the end when he says, “enjoy your dog.” It is clear that he does. I was totally absorbed in this book. Pointers is a great book and enjoyable to read. It is such a good training guide. I just love it!